I love home-made pasta, and I’ve been using my benchtop pasta machine over the years with success. I recently began using the pasta making attachments to my Kitchen Aid. The roller and cutters are essentially the same as the benchtop version, except that there’s no hand turning, as the machine rolls and cuts using the Kitchen Aid’s motor. This is really great as you’ve now got two hands free to feed and guide the pasta to create pasta sheets and beautiful cut pasta! 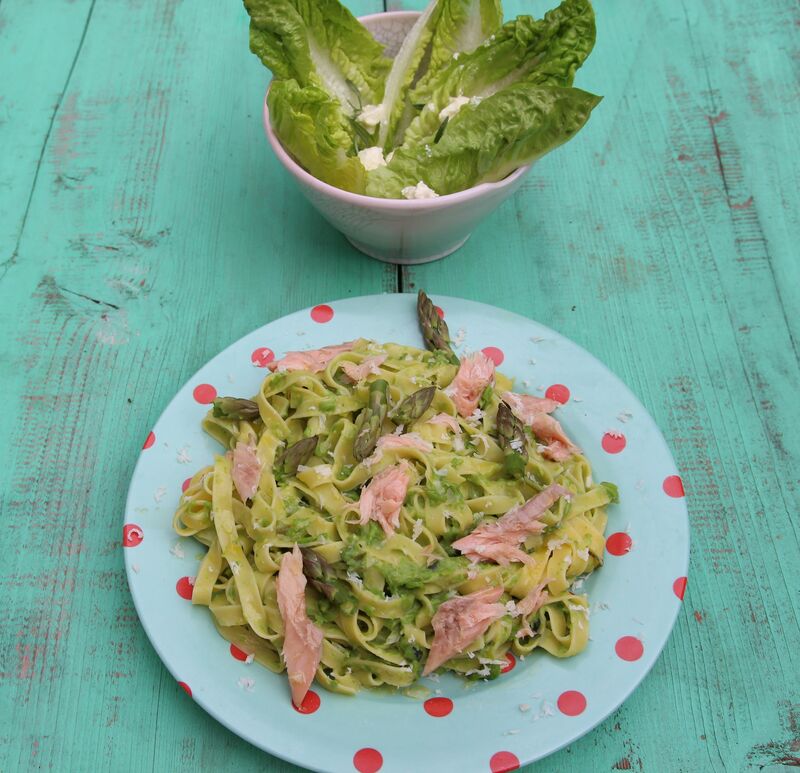 The basic recipe I use for the pasta dough is a Jamie Oliver recipe, from his Cook With Jamie. Click here for the original recipe. It’s straightforward and easy to follow. For my pasta, I added some mashed baked pumpkin to give the pasta a lovely orange colour and subtle taste. (I used half Jamie’s quantities which made a good 2 dozed or so ravioli). I filled the ravioli with goat’s cheese mixed with wilted watercress, and also pumpkin, thyme and hazelnuts. I was very happy with the tasty results! 3 tablespoons or so of butternut pumpkin (squash) baked in the oven with a little olive oil, then mashed. The amount you use will depend on how “orange ” you want the pasta to be. If you add too much, the pasta will be too soft to roll, so start out adding less – you can always add more. Put the eggs and flour into a food proccesor and whiz until the flour looks like breadcrumbs, then tip the mixture on to the work surface and bring the dough roughly together. Add the baked pumpkin, starting off with a little at first, then adding more if you need to. Bring the pasta dough together into one lump. Knead the dough and work it with your hands to develop the gluten in the flour, until the pasta dough starts to feel smooth and silky instead of rough and floury. Wrap the dough in cling film and put it in the fridge to rest for at least half an hour before you use it. Now is the time to prepare your filling, so you are ready to fill the ravioli once the pasta is rolled. To wilt the watercress, place it washed in a small frying pan or saucepan with the barest amount of water. Cook over a low heat until it wilts. Break up the goat’s cheese with a fork, and mix in salt and pepper to taste. To half the goat’s cheese add the watercress, and to the other half mix in the mashed pumpkin, thyme leaves and roast chopped hazelnuts. 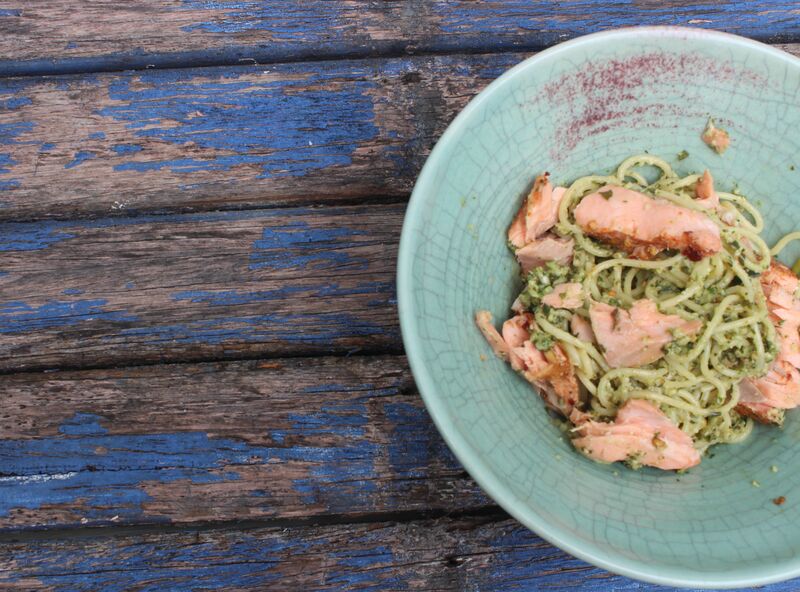 I should note here that I inadvertently mixed in some wilted watercress into some of my pasta dough – so I went with it – creating some lovely green speckled pasta dough that you can see in some of the photos. A happy accident! For the pasta, dust your work surface with some Tipo ‘00’ flour, take a lump of pasta dough the size of a large orange and press it out flat with your fingertips. Set the pasta machine at its widest setting – and roll the lump of pasta dough through it. Lightly dust the pasta with flour if it sticks at all. Click the machine down a setting and roll the pasta dough through again. Fold the pasta in half, click the pasta machine back up to the widest setting and roll the dough through again. Repeat this process five or six times. It might seem like you’re getting nowhere, but in fact you’re working the dough, and once you’ve folded it and fed it through the rollers a few time, it should be smooth and silky. Now roll the pasta dough working it through all the settings on the machine, from the widest down to around the narrowest. Lightly dust both sides of the pasta with a little flour every time you run it through. When you’ve got down to the narrowest setting, fold the pasta in half lengthways, then in half again, then in half again once more until you’ve got a square-ish piece of dough. Turn it 90 degrees and feed it through the machine at the widest setting. As you roll it down through the settings for the last time, you should end up with a rectangular silky sheet of dough with straight sides. 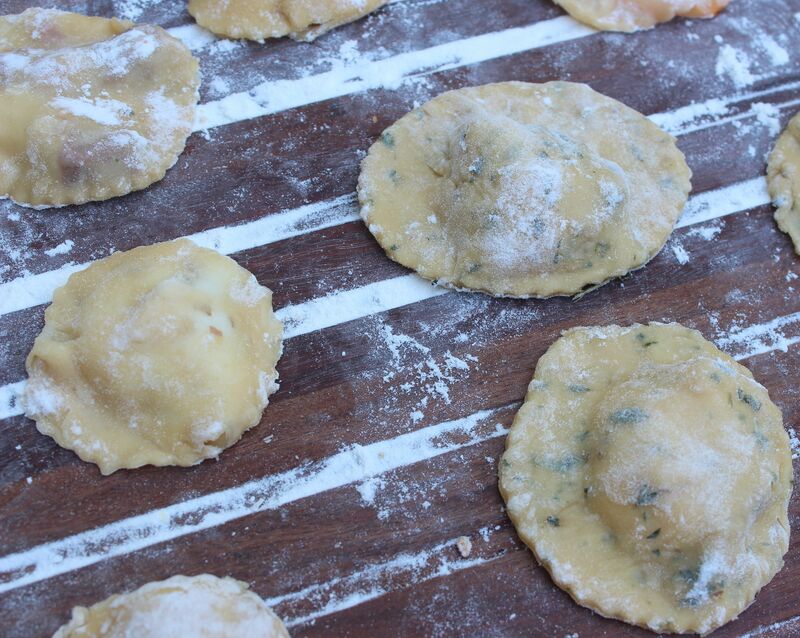 For ravioli, roll the pasta down to the point where you can clearly see your hand or lines of newsprint through it. Once you have rolled the pasta, you will need to work quite quickly, as the pasta dries out. Place the rolled pasta on a lighly floured board. Cut the pasta sheets into two if they are really long, or use two rolled sheets if they are the right length to make the ravioli. You can cover the unused sheets with a tea towel for a few minutes while you are making ravioli with the other sheets. Place small spoonfuls of the filling on one pasta sheet, allowing for a border when you come to cut the ravioli. Moisten the exposed pasta and put the other pasta sheet on top. Press down to divide the sheets into individual ravioli and, making sure you don’t trap any air with the filling, seal the ravioli edges. Cut pasta into shapes using a pastry cutter or a sharp knife. Dust the ravioli with a little flour to help them keep their shape if you’re not cooking immediately, or alternatively pack them carefully into freezer bags and freeze for cooking in the future. Bring a large saucepan of salted water to the boil and put the ravioli in. 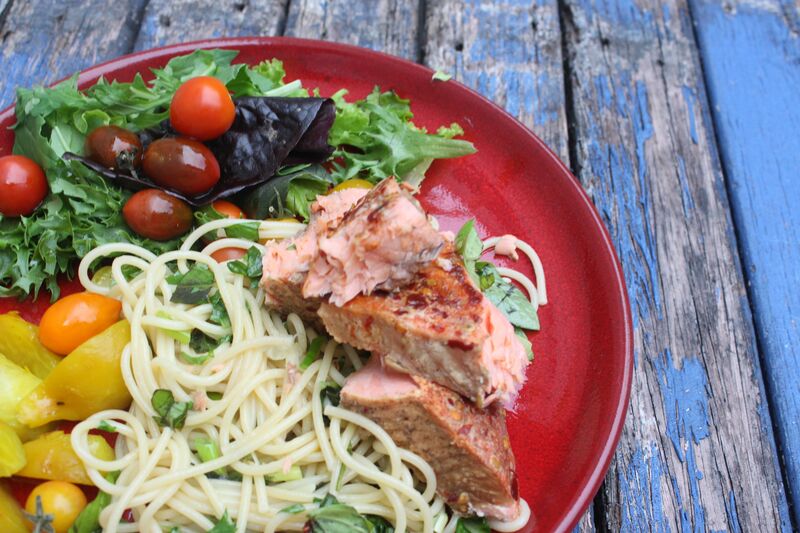 Cook for 3-5 minutes, or until al dente. The fresher the ravioli are, the quicker they will cook. For a quick sauce, heat a little butter in a frying pan until the butter foams and add lots of black pepper. 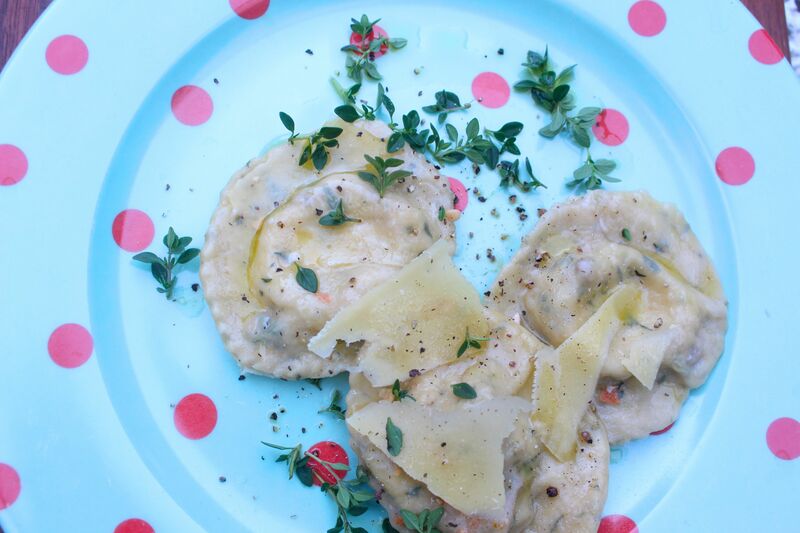 Pour over the ravioli and serve with shaved parmesan. 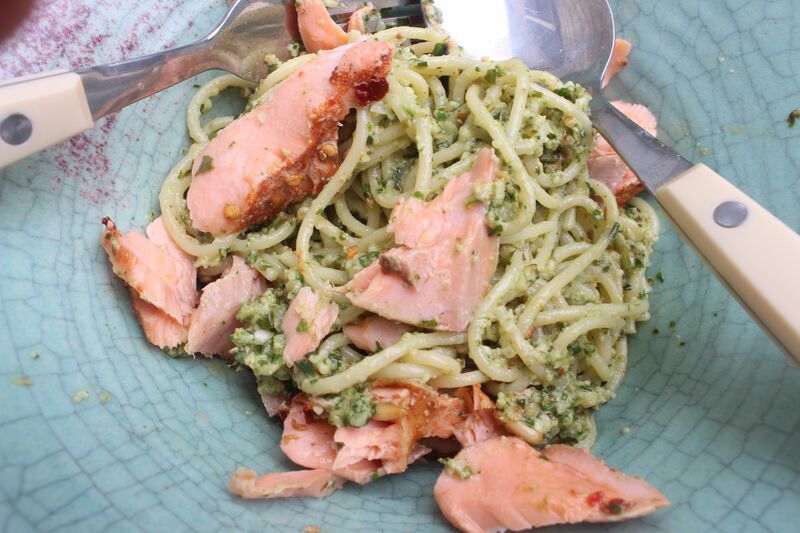 Posted in Jamie Oliver, Pasta, Savoury Food. Bookmark the permalink. This is a simple recipe which can be created quite quickly. Everyone has their favourite meatball recipe – as usual I got my inspiration from a couple of Jamie Oliver recipes. Mix all the ingredients with the exception of the olive oil in a large bowl, making sure you break up all the lumps! If the mixture is too wet, add a few more breadcrumbs.The mixture should be firm enough to handle. Roll the mixture into small balls – I like golf ball size meatballs, but you could go a little bigger if you wanted. Heat the olive oil in a large frying pan and cook the meatballs for 8–10 minutes until brown. You can test that they’re cooked by opening one up – there should be no sign of pink. Remove from pan and set aside while you make the sauce. Using the frying pan from the meatballs, heat the olive oil and fry the garlic for a minute. Add the tinned tomatoes, breaking them up gently to help them reduce into a sauce. Add all the other ingredients, stirring gently. Simmer for 20 minutes. Add the cooked meatballs to the tomato sauce and simmer for 5 minutes. Drain the cooked pasta, reserving a tablespoon of cooking liquid to add to the tomato sauce. 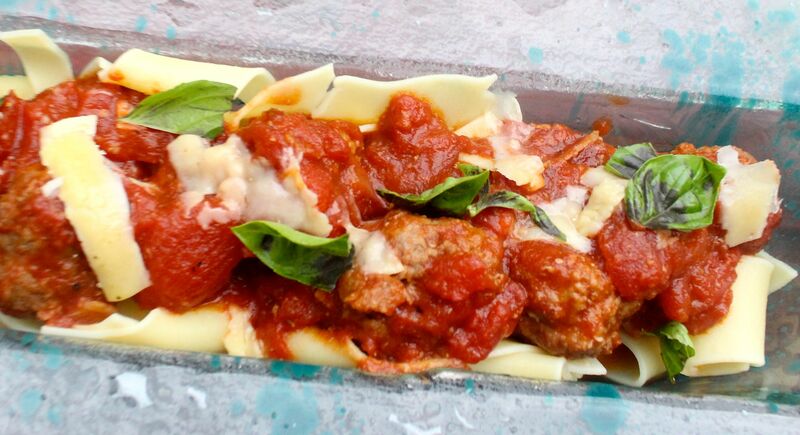 Spoon the tomato sauce and meatballs over the pasta, and serve with shaved Parmesan and basil leaves. 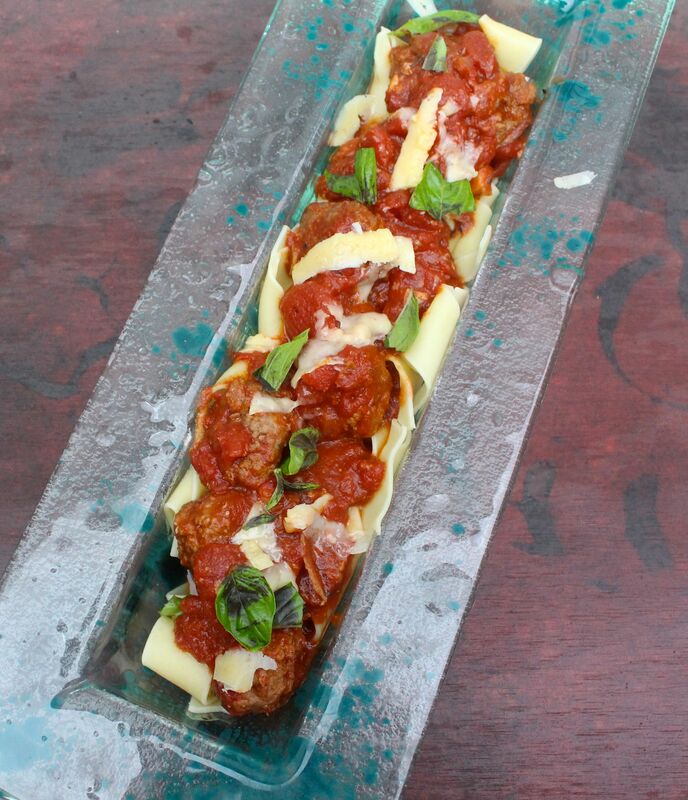 Posted in Pasta, Savoury Food and tagged meatballs, pappardelle, Parmesan, tomato sauce. Bookmark the permalink. Last weekend I decided to make fresh pasta. I hadn’t made pasts in ages, and I was a little apprehensive about setting up the pasta machine and actually using it again. 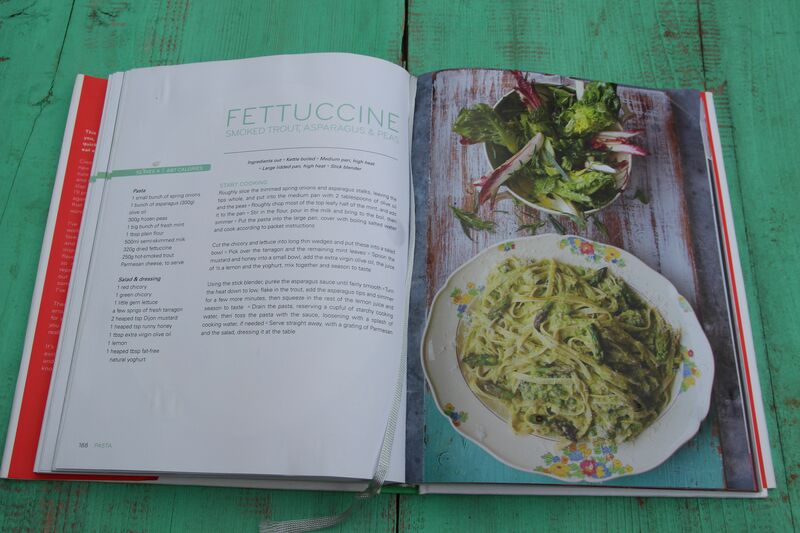 I followed faithfully a recipe from Jamie Oliver ‘s Cook with Jamie. I am a huge fan of Jamie Oliver and have every cookbook. I think that Cook with Jamie is a really great book with its no nonsense approach to basic cooking skills. This recipe makes quite a lot of pasta dough. I suggest halving the quantities to make about 12 large ravioli. I mixed in fresh thyme leaves to half of the dough before the kneading stage to make the Thyme, Taleggio and Walnut Ravioli. 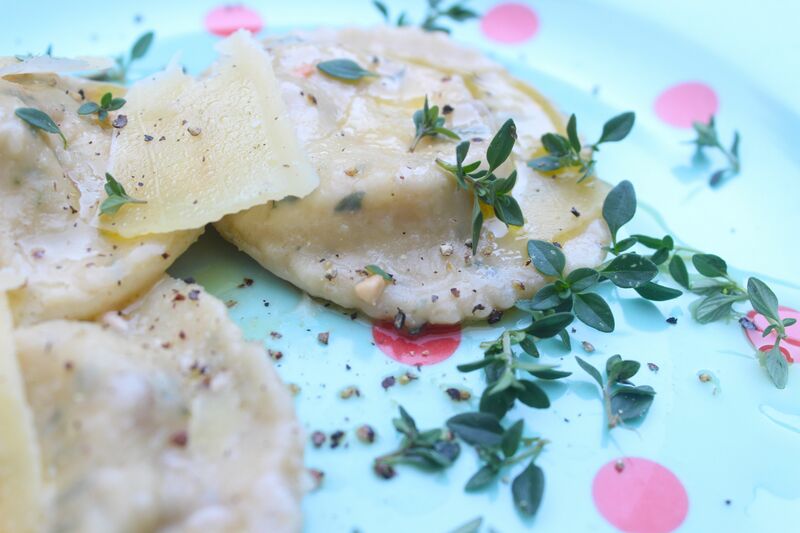 For each kind of ravioli, use the pasta machine to roll the dough so you have 2 thin sheets. It’s important to roll the pasta sheets so they are very thin; I didn’t quite get the sheets thin enough so the pasta was a little thick. Combine a small handful of fresh thyme leaves,100 gms or so of taleggio and a dozen or so walnuts chopped. Combine 100 gms or so of pecorino and a small handful of chopped sundried tomatoes. For each kind of ravioli, place 6 small spoonfuls of each mixture on one pasta sheet, allowing for a border when you come to cut the ravioli. Moisten the exposed pasta and put the other pasta sheet on top. Press down to divide the sheets into 6 and, making sure you don’t trap any air with the filling, seal the ravioli edges. Cut pasta into shapes using a pastry cutter or a sharp knife. I dusted the ravioli with a little flour to help them keep their shape as I wasn’t cooking them for an hour or so. Bring a large saucepan of salted water to the boil and put the ravioli in. Cook for 5 minutes until al dente. For a quick sauce, heat a little butter in a frying pan until the butter foams; pour over both kinds of ravioli and serve with additional shaved pecorino. Posted in Pasta, Savoury Food and tagged Jamie Oliver, pasta, pasta machine, pecorino, sundried tomato, taleggio, thyme, walnuts. Bookmark the permalink.